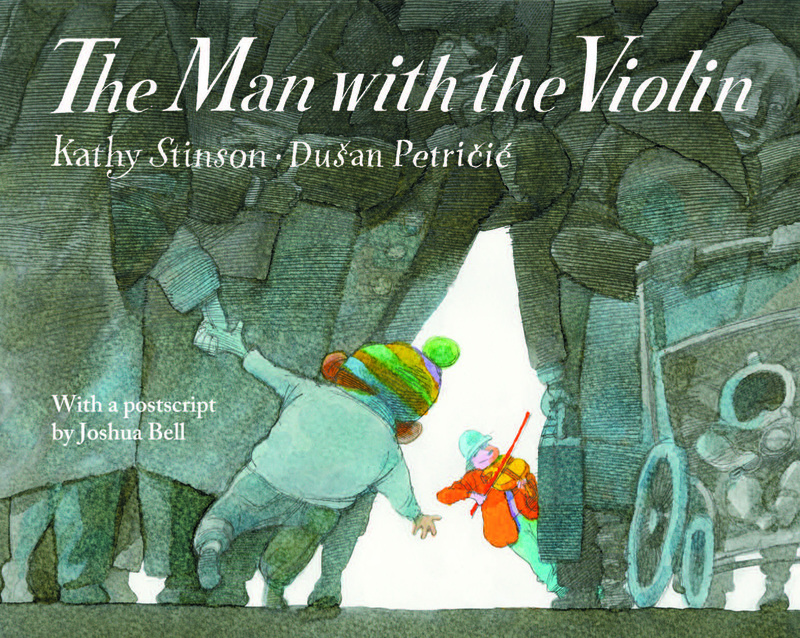 The Man with the Violin by Kathy Stinson and illustrated by Dušan Petričić is a wonderful picture book based on the true story of the famous violinist Joshua Bell (as seen in the video above) who did a free concert in the Washington D.C. subway several years ago. Thousands of people passed him but few stopped to listen to his astounding music. The book is about an observant little boy who notices the beautiful music of a violinist in the subway while others rush past without a second look. The black and white illustrations with rainbows of colour to symbolize beautiful music make for a book rich with inferences. The dedication by Stinson at the front of the book reads, “To all my musical grandchildren and especially to Peter, who even more than the others helps us pay attention to what we might otherwise miss.” What do you think the author means? Describe the things that Dylan notices by carefully examining the illustrations on the first two pages of “The Man With the Violin.” Using the picture, compare Dylan’s ability to notice things to his mother’s. Colour is used throughout the book to represent music while noise is represented quite differently. Find examples to explain. Some illustrations are in colour and some are in black and white. Use clues from the book and your own ideas to explain why. Dylan has a profoundly positive effect on other people. Use clues from the text and pictures to explain. Look at the illustration where Dylan and his mom are going home on the subway. Why do you think that the illustrator chose not to have any sound markings coming out of Dylan’s mouth when everyone else who is talking has them? In the postscript at the back of the book by the violinist Joshua Bell, writes, “music requires imagination and curiosity.” What do you think he means by this statement?